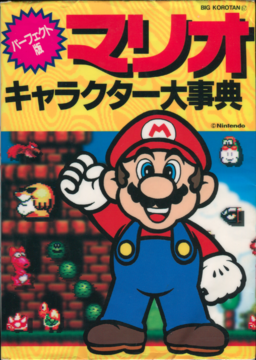 The Perfect Edition of the Great Mario Character Encyclopedia (「パーフェクト版 マリオキャラクター大事典」) is a publication published in 1994 by Shogakukan and written in collaboration with Nintendo. It is mainly a character book containing short bios about characters, as well as general information (country of origin or, in the case of enemies, group to which they belong, personality, games the characters are featured in) and a few other tidibits of information. It also covers the games and the characters featured within them. The main games, as ordered by the book, are Super Mario Bros., Super Mario Bros.: The Lost Levels, Super Mario Bros. 3, Super Mario Bros. 2, Super Mario World, Super Mario Kart, Mario & Wario, Super Mario Land, Super Mario Land 2: 6 Golden Coins, Wario Land: Super Mario Land 3, Donkey Kong (Game Boy), Donkey Kong (arcade), Donkey Kong Jr., Mario Bros., and Wrecking Crew. The lesser ones, shown at the end of the book, are Donkey Kong 3, Dr. Mario, Mario Paint, Yoshi's Cookie, Yoshi, Yoshi's Safari, and Wario's Woods. The main characters are shown after the main games, and use colored artwork. Lesser characters and species are listed afterwards via Japanese alphabet, and use black and white artwork. Most artworks used here had already been published in previous materials; for characters and enemies for whom no existing artwork was available, original artwork was created based off sprites. A manga about Larry Koopa. A page detailing various traps and obstacles. 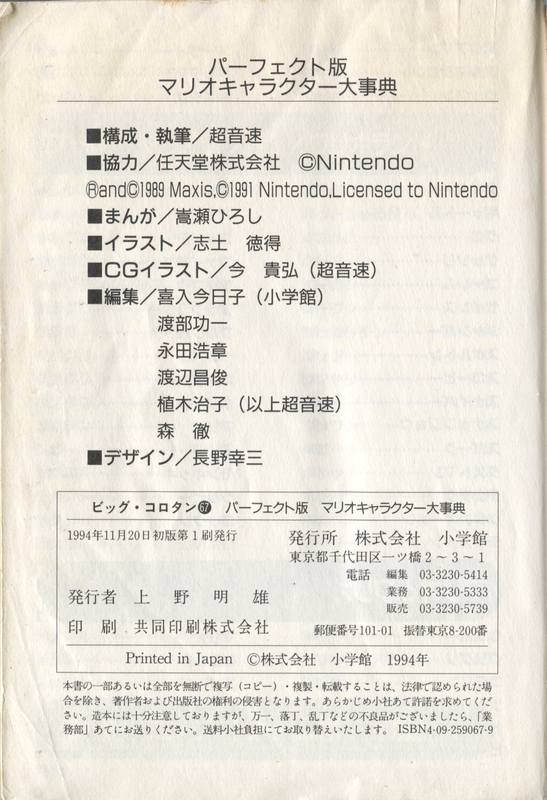 ↑ The last page of the Perfect Edition of the Great Mario Character EncyclopediaMedia:PEGMCE Last Page.png, showing that the book is written in collaboration with Nintendo Co., Ltd. (「協力/任天堂株式会社」. This page was last edited on February 9, 2019, at 20:20.